Four men were inducted as the 2014 class of the Lou Holtz Upper Ohio Valley Hall of Fame during a banquet featuring a keynote address from Pittsburgh Steelers quarterback Ben Roethlisberger Monday evening at St. Florian Hall. Holtz, the East Liverpool native and NCAA coaching legend, said he comes back to the area because it’s where he learned the values that have served him in life. “We were poor, but I say I was born with a silver spoon in my mouth because I was born in the greatest country in the world, and there were people who taught me the value of choices. They taught me to take responsibility for my actions. We were very poor, but it’s not what you had. It’s who you had, ” Holtz said. Holtz said anyone who achieves success had to make sacrifices and overcome adversity along the way. For Roethlisberger, adversity included the loss of his mother in a car accident when he was 8 years old. He said it doesn’t matter if a person has everything or was born with nothing. Everyone faces adversity, and it always gets better. He said there are many ways to be a leader, but he has found leading from behind allows him to observe and help teammates. “You can be the first out on the field and be that rah-rah guy. I am the last one out. I want to see the faces of my team so I can see what’s going on,” he said. Roethlisberger said that allows him to see who needs to be calmed down, who needs to be pumped up and who needs to get over any fears. “I want to get the best out of those guys. Sometimes, by being in the back, you can see what’s going on ahead of you,” he said. 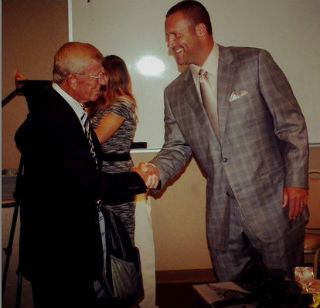 Roethlisberger impressed me with his speech Monday night at the Lou Holtz/Upper Ohio Valley Hall of Fame event at St. Florian Hall. He claimed it was only his second time at public speaking, and the 700 (give or take) at St. Florian was his largest audience. He proclaimed a bit of nerves, but he proceeded, without a single note, to present a coherent speech about character, loyalty, hard work and leadership. He was inspiring, funny and humble. And when he said he played hard as a kid after losing his mother in a car crash when he was only 8, “so she could be proud of me watching from heaven,” he surely sounded sincere. I also noticed that he really looks young. As in, barely older than my kids, which he barely is. You can read more from this column here. You can view another photo here. *Thank you to both Matthew Peaslee and Amber Lattner for the photos!